Bright colors, voice announcements and a TFT touch screen is what makes the Graupner mz-18 one of the most versatile radios on the market, and at a price that can’t be beat! Experience a new level of connection between you and your model with 9 channels and built-in real-time voice telemetry. Colorful menus and displays make usability easy to navigate through the menus and setup options with the touch of your finger or a stylus. Traditional navigation keys provide an old-school experience if you prefer to push physical buttons. The aluminum quad bearing 4096 resolution gimbals were machined with high-precision and are adjustable for smooth and accurate flight control. Safe and worry-free flights are achieved with our HoTT (Hopping Telemetry Transmission) technology by hopping over 75 2.4 GHz channels to secure the most reliable, interference-free operating channel. Real-time telemetry is integrated in all our HoTT radio systems. The mz-18 does not require any additional hardware for functions such as signal quality, temperature, or receiver voltage. The included 12-channel and 6-channel receivers provide telemetry functions that can be configured to notify you regarding any system changes. Graupner provides a wide selection of telemetry ESCs, modules and sensors that can immediately connect directly to your HoTT receivers without the need for external hub boxes or complex wiring. Our third-party partners provide additional telemetry products that work seamlessly with your mz-18 HoTT radio. Telemetry functions and notifications can be easily assigned to switches to provide information about battery voltage, battery capacity, altitude, flight direction, speed, etc. This is integral in increasing your situational awareness and adding extra flight safety. The real-time, bi-directional HoTT transmission protocol will constantly monitor system health and notify you of any changes to the system. No more surprise situations such as sudden battery depletion or accidentally flying out-of-range! During flight, important data is logged on the SD memory card which can be analyzed to improve your system’s reliability and performance. Need to reverse your motor direction, setup your flight controller or program receiver settings? 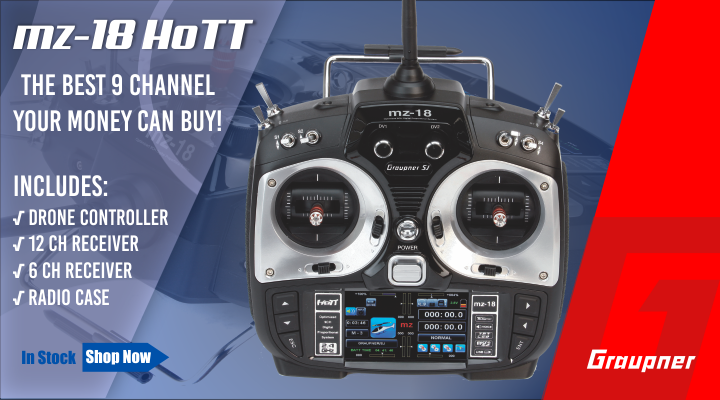 The mz-18 radio can easily setup, program, and change all Graupner HoTT products remotely. No need for cables, computers or programming boxes! Each HoTT device contains a website-like user interface allowing your mz-18 radio functions as a browser to access the HoTT device allowing you to make on-the-spot changes at the field and even in the air during flight! It is important to all of us at Graupner that you make good use of your investment in our products. All our HoTT products (receivers, flight stabilization systems, ESCs, multirotor flight controllers, flybarless controllers, etc.) are designed to be compatible with one another regardless of the transmitter being used. This unified technology standard will ensure the same operation and user experience across all devices, making our products future-proof for new developments. Our wide selection of HoTT flight controllers for flybarless helicopters, airplanes and multirotors will further enhance the usability of your mz-18, providing endless opportunities to discover all the radio has to offer. Our Wireless Trainer Link allows the mz-18 radio to be used with any other Graupner HoTT radio in Student/Teacher Mode, allowing everyone to learn or teach about the exciting experiences this hobby has to offer.